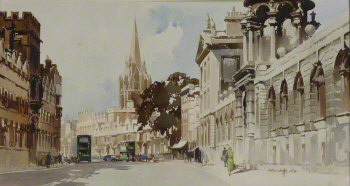 Claude Buckle painted 26 railway Carriage Prints for British Rail during a short period between 1952 and 1957. Carriage prints as the name suggests were small pictures placed under the luggage racks in the single compartments of carriages which were in fashion in the 50's and 60's. Usually there were 4 pictures to each compartment with two dividing mirrors or maps. See illustration. All the carriage prints were drawn of real places and nearly all exist today. To see the locations click on the railway carriage print location map page. Carriage print illustrations are not so well known about as Railway posters. This is because not all carriages had carriage prints where as all stations and waiting rooms had posters. 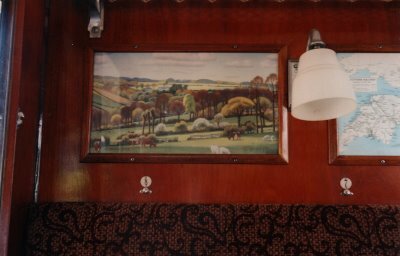 However the pictures tended to be of a much more artistic quality with the intention of decorating the interior of a carriage rather than being just an advertisement. For further information see Landscapes under the luggage rack by Greg Norden.